After four years of ups and downs with soccer robots in the Mexican Robotics Tournament (Torneo Mexicano de Robotica, TMR), we returned to the first place! 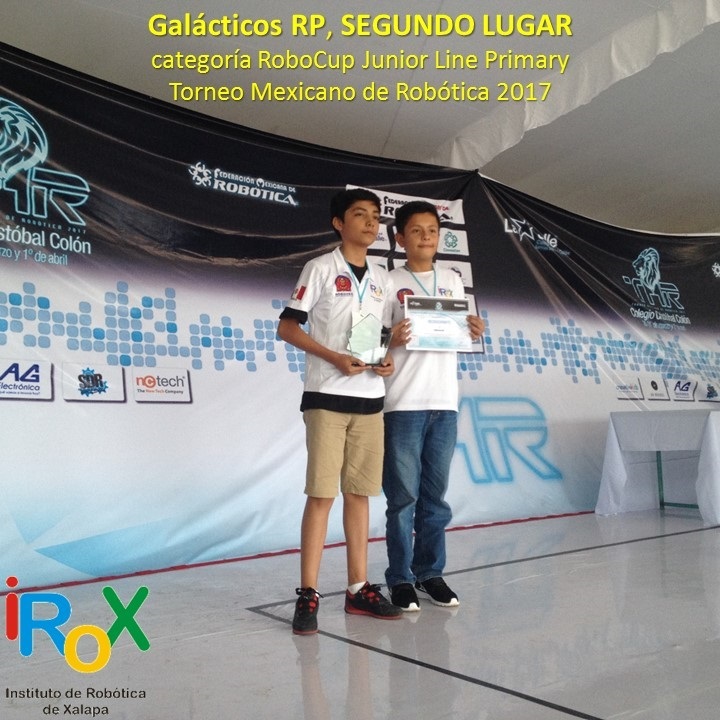 Our first team of young roboticists, now from the Instituto de Robótica de Xalapa (Robotics Institute of Xalapa), Galacticos, won the FIRST PLACE in the Mexican Robotics Tournament 2018 (TMR 2018), held in Monterrey, NL, in the category RoboCup Junior Soccer LightWeight. 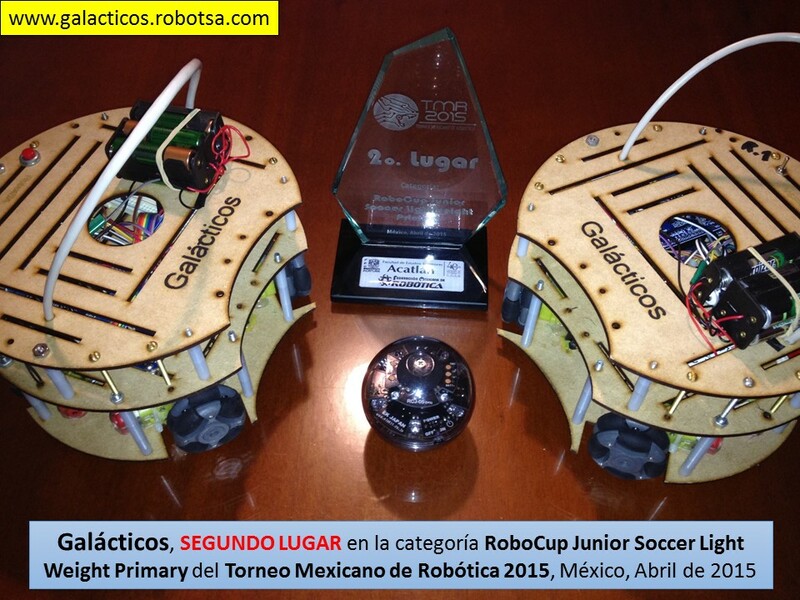 In TMR 2014 we won the first place also with soccer robots, when our Galacticos team was made up of 12 and 13 years old children. 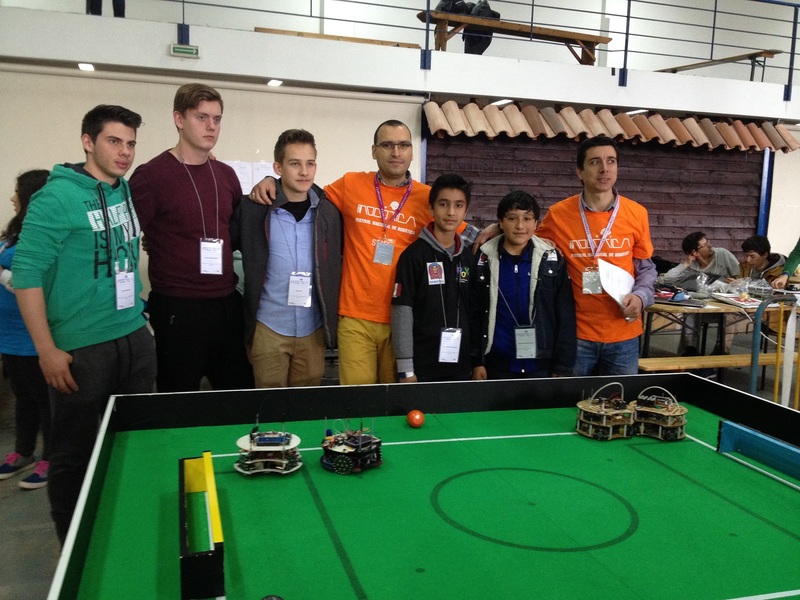 That year we participated in RoboCup 2014 in Brazil. 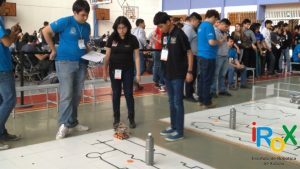 The first place in the TMR 2018 gives us the right to compete in the most important robotics event at international level, RoboCup 2018, which will be held in Montreal, Canada, from June 17 to 22. Thanks to our experience of these four years, and international participation in Brazil (2014) and Portugal (2016 and 2018), we know that we have to work much harder to lead a highly competitive team, so we look for donations and sponsorship. 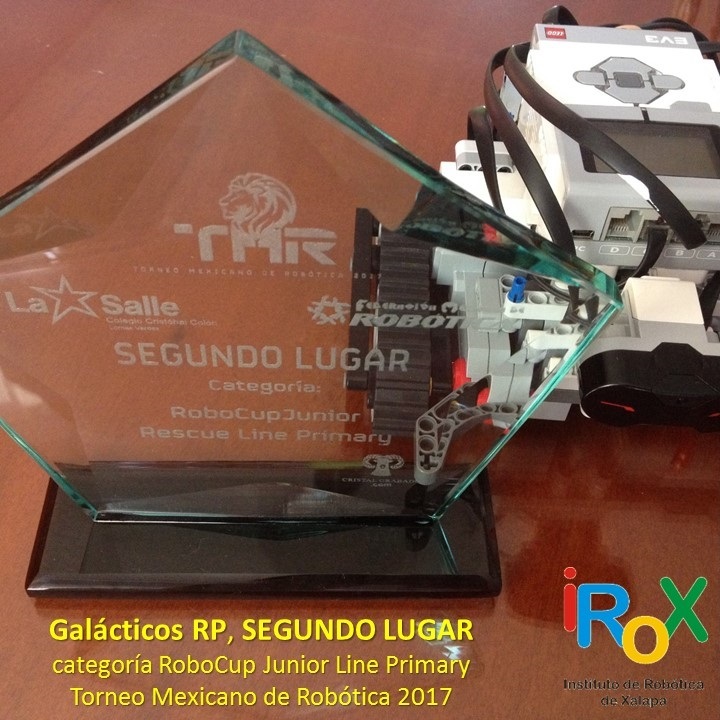 For more information about this triumph visit the Galactic page go to RoboCup 2018 in Montreal Canada, where we have a button to receive donations. 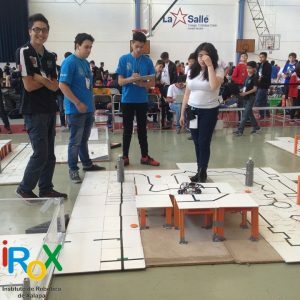 Would you like to sponsor a team of young roboticists? 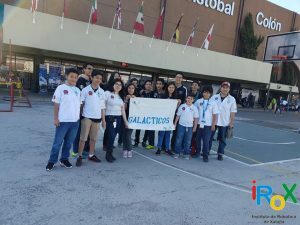 If your company or institution is interested in sponsoring the team, visit the Galactic page look for sponsorship for RoboCup 2018. And not only we won the first place in Soccer!, also SECOND PLACE in Rescue and THIRD PLACE in OnStage. 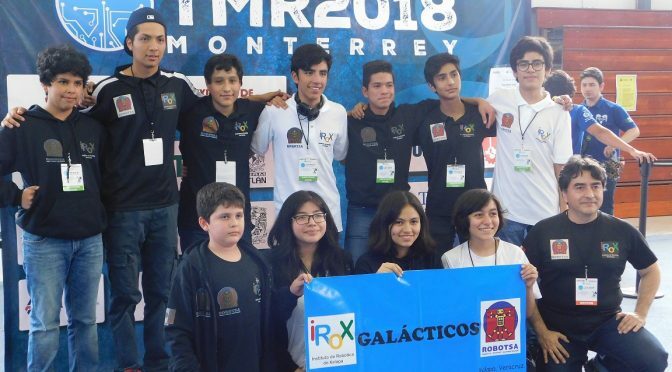 You can see more information on the web page Galacticos won in the Mexican Robotics Tournament 2018. 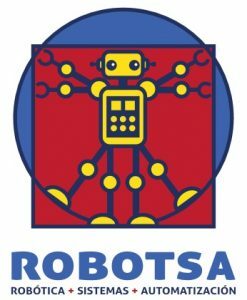 If you know a child and young person who would like to take our robotics courses and participate in robotics contests, contact us at galacticos@robotsa.com. 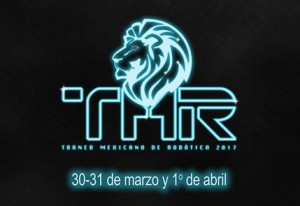 From March 30 to April 1, 2017, the Robotics Institute of Xalapa (iRoX), participated in the 2017 Mexican Robotics Tournament (TMR 2017), organized by the Mexican Federation of Robotics and the Cristóbal Colón School in the State of Mexico. Galacticos, in the RoboCup Junior Soccer Lightweight Secondary category, with five young people from 15 to 16 years old. 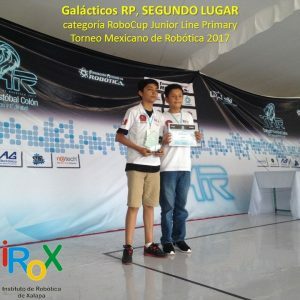 Galactic RP, in the category RoboCup Junior Rescue Primary, with two children of 12 years. 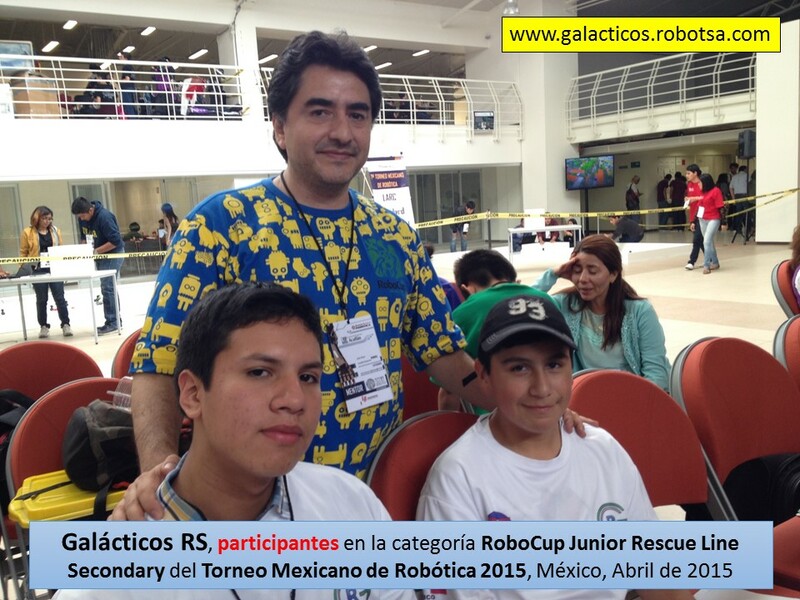 Galacticos RS, in the category RoboCup Junior Rescue Secondary, with four young people from 15 to 19 years old. Golden Jet, in the OnStage Primary category, with four children from 10 to 13 years old. 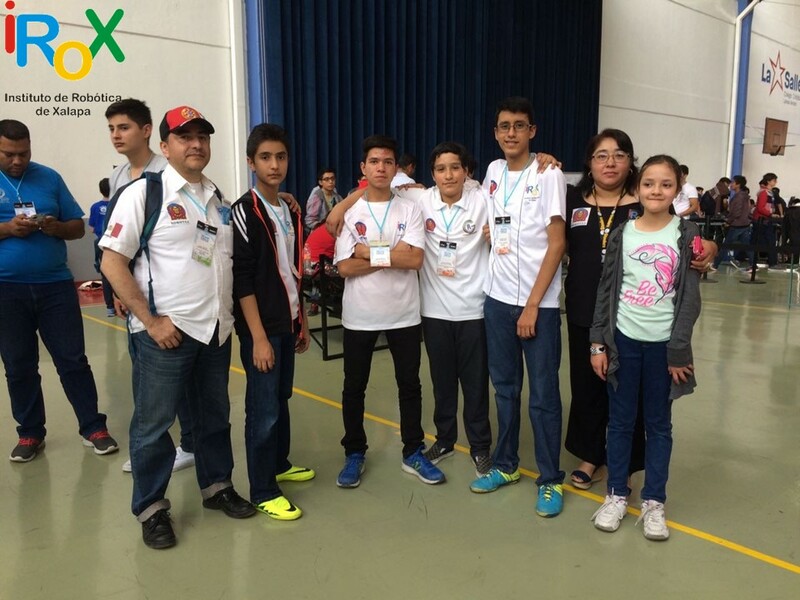 Our Galacticos RP team, formed by René and Eric, won the SECOND PLACE with a rescue robot Lego Mindstorms EV3. 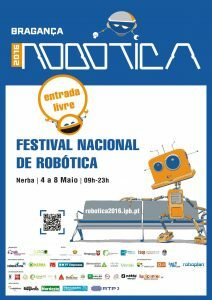 The Galacticos team of the Robotics Institute of Xalapa (iRoX), participated in the XVI portuguese robotics open, from May 4 to 8, 2016, in Bragança, Portugal (http://robotica2016.ipb.pt/). 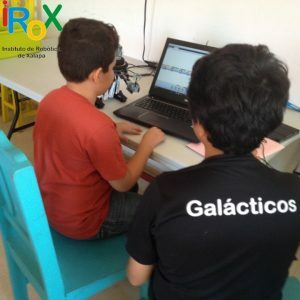 In this event, also called Festival Nacional de Roblotica (National Robotics Festival), the Galacticos team won the THIRD PLACE in the category RoboCupJunior Soccer Light Weight (08-14 years old). Additionally, the Organizing Committee awarded the Galacticos team the Fair Play Award in the same category. In the next photo, the opposing team for the third place, referees and our two Galacticos boys (Rafael and Oscar among the referees with orange shirt). 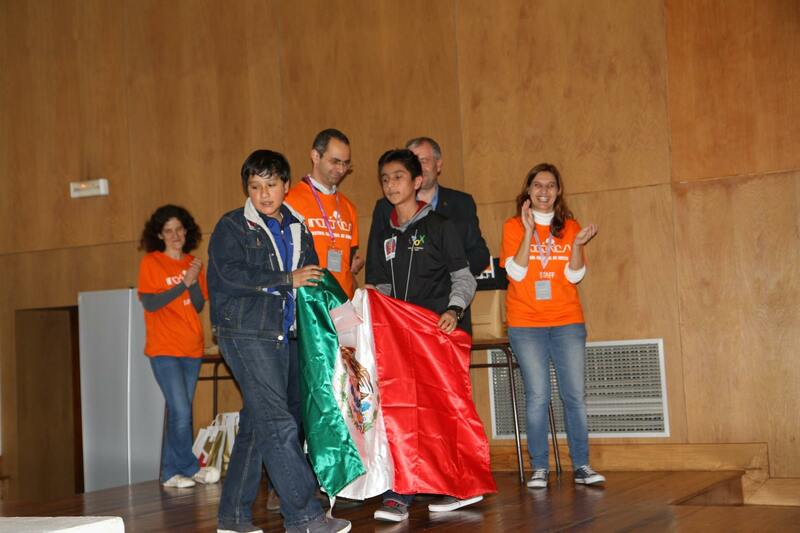 In the following photos, Galacticos receiving the Fair Play Award, proudly carrying their Mexican flag. Congratulations to Team Galacticos! Rafael, Oscar and Eduardo (who could not go to the contest), as well as mentor Julio Sandria. 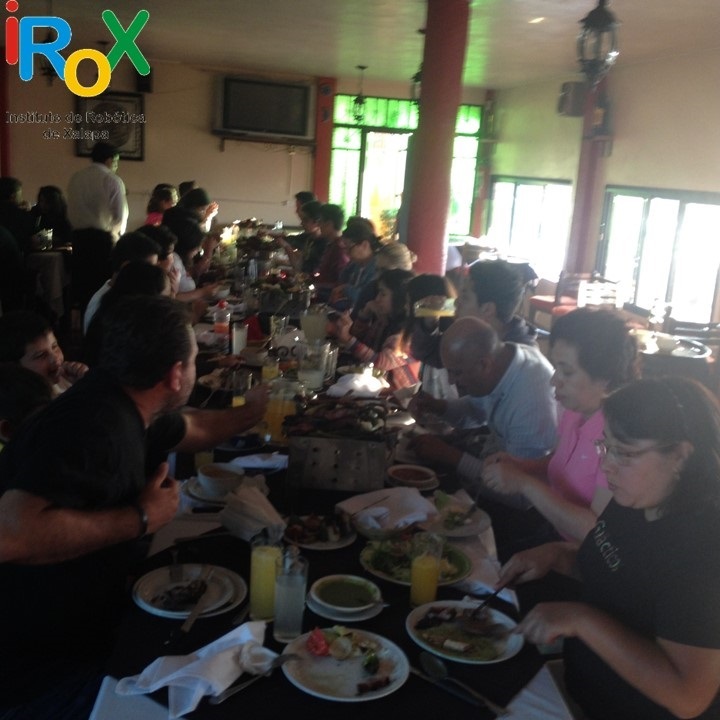 We thank our sponsors, thanks to their support we have managed to participate in this event. Hello! 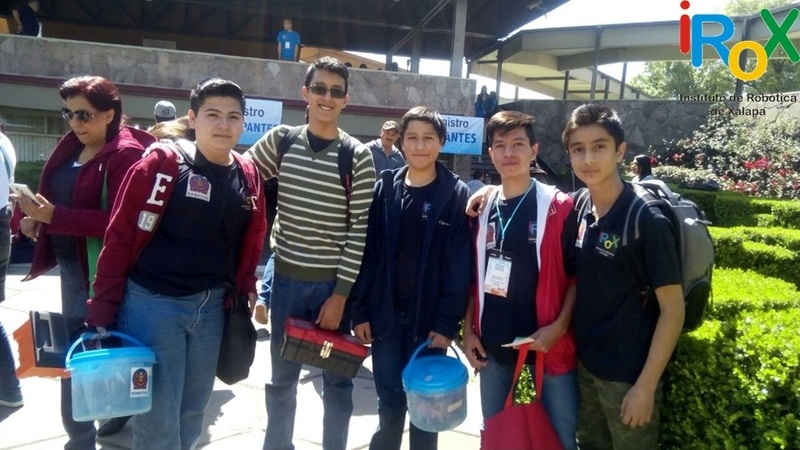 In April 2015, with the help of mothers and fathers, I had the opportunity to take an enthusiastic group of roboticist boys to the 2015 Mexican Robotics Tournament (TMR 2015). The group consisted of two Galacticos teams and eight teams from General 5 School in Xalapa, Veracruz, Mexico. In the following picture there are the guys from Galacticos, Galacticos RS and some guys from the General 5 School. 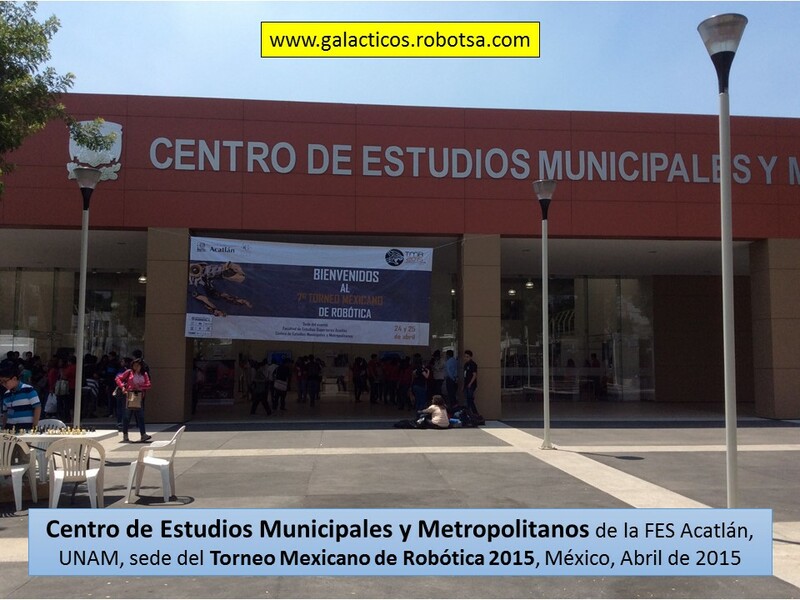 The TMR 2015 was held from April 23 to 25, at the Center for Municipal and Metropolitan Studies of the Acatlán School of Higher Studies (FES Acatlán) of the UNAM, in the State of Mexico. 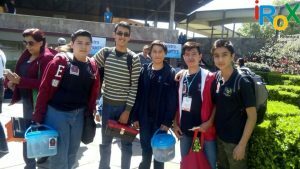 For all the boys of the General 5 school was his first experience in a robotics tournament. Some teams were regular and others not so regular. The main idea was to take them to know what other kids of their age do in the area of robotics, in our country. 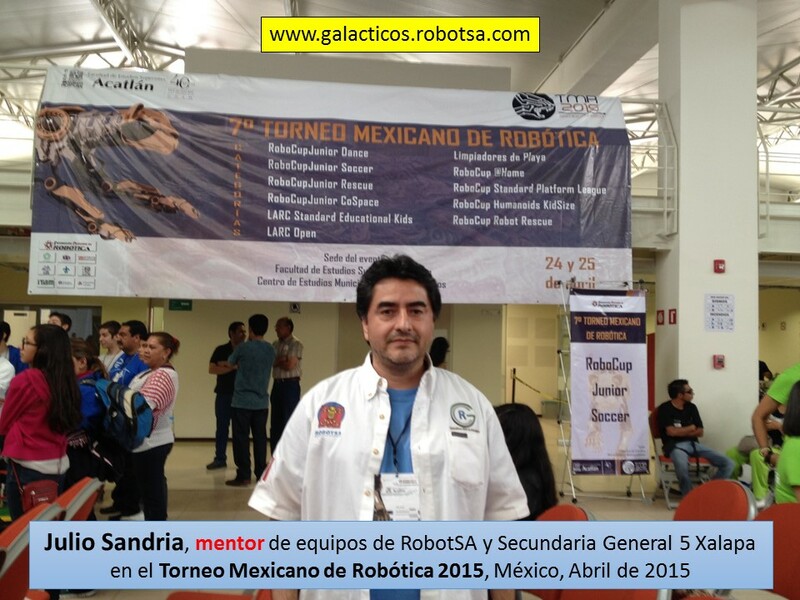 Initially, I served as a mentor to the teams of the General 5 School and the Galactic teams of RobotSA. I am grateful for the professional help of Arnold Landa, Ana Sánchez and Oscar Sandria, who served as “associated mentors”. 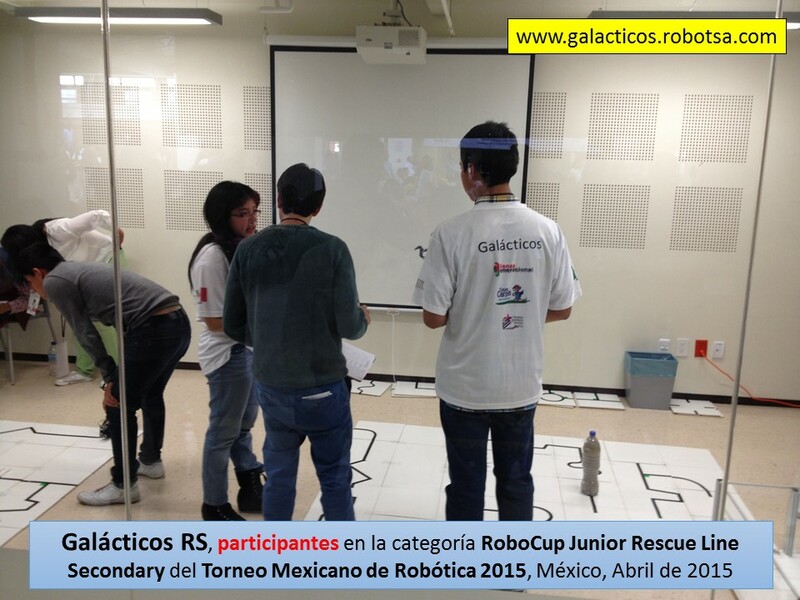 The Galacticos RS team of RobotSA, was formed by Mario, Carolina, Samuel and Miguel. This team participated in the category RoboCupJunior Rescue Line Secondary, although not with good results. In the next photo are the guys from Galacticos RS, in the Galacticos Home. 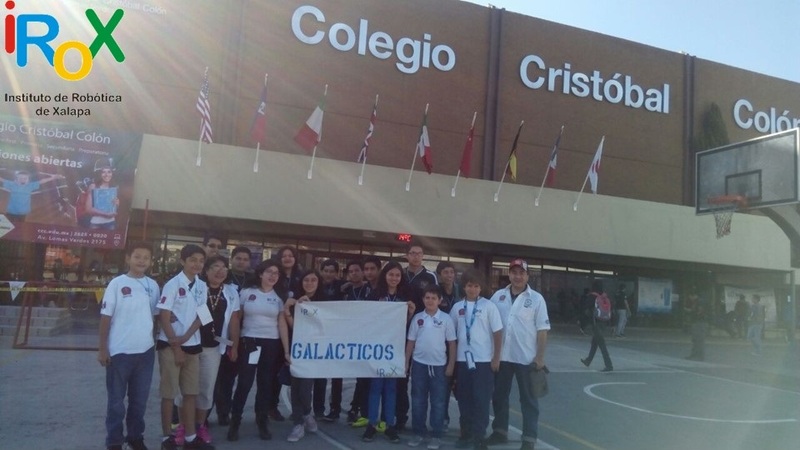 This is the first time that the Galacticos RS team participates as a team and had less than two months to work on their robot. In the next photo I’m with two guys from Galacticos RS. 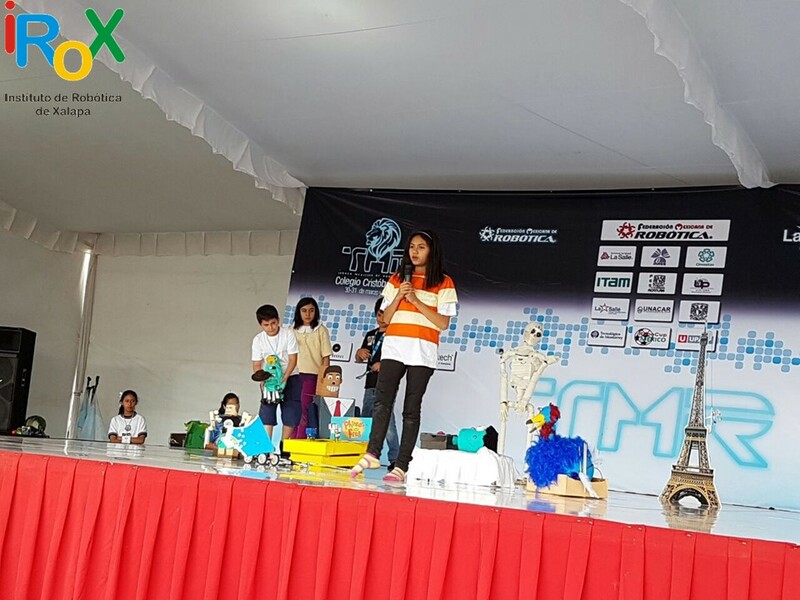 I hope they have been motivated to continue participating and return to the next TMR with more enthusiasm and desire to work in robotics. 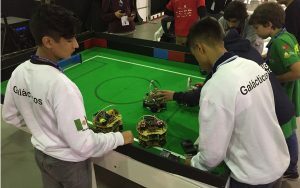 In the following photo, two members of the Galacticos RS team in one of the tests of RoboCup Junior Rescue Line Secondary in the TMR 2015. 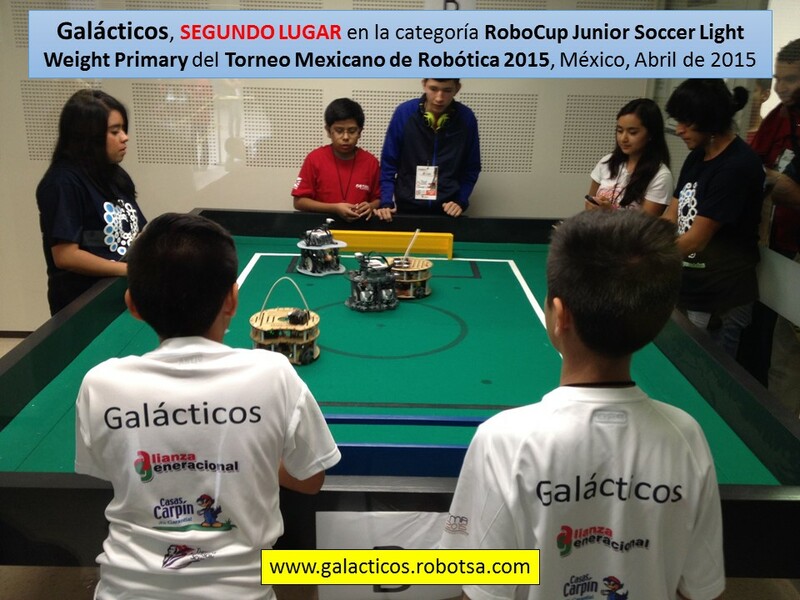 The RobotSA Galacticos team, again participated in the category RoboCupJunior Soccer Light Weight Primary. 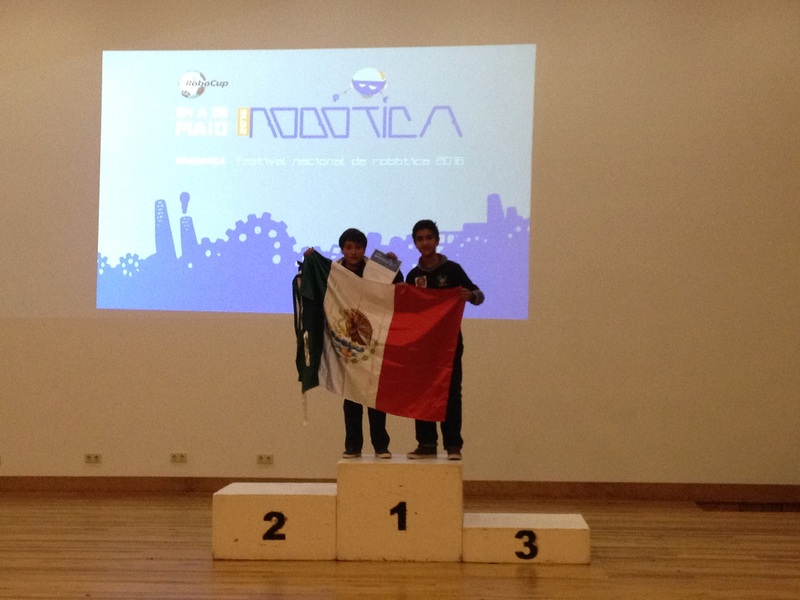 In the TMR 2014, this team won the FIRST PLACE, which allowed us to represent Mexico in the RoboCup 2014 in Brazil. In the next photo, two Galacticos boys in a soccer match. This year, the Galacticos team was made up of five members. Three of them from the initial team of 2014: Rafael, Gersom and Imanol. 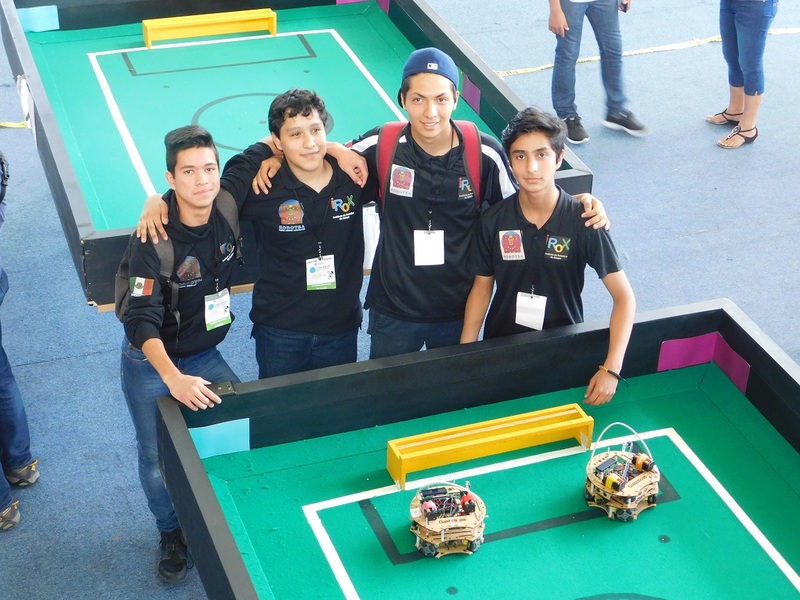 This year joined the team Oscar and Sahid, who have participated enthusiastically in the preparation of the new Galacticos robots. 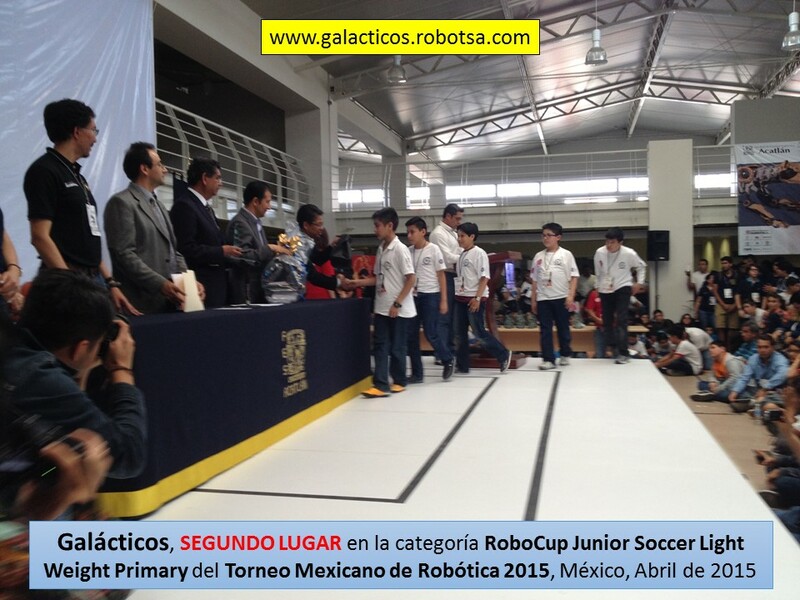 In the next photo, there are two Galacticos guys with the first place winner of the RoboCupJunior Soccer L. Primary category, of the TMR 2015. 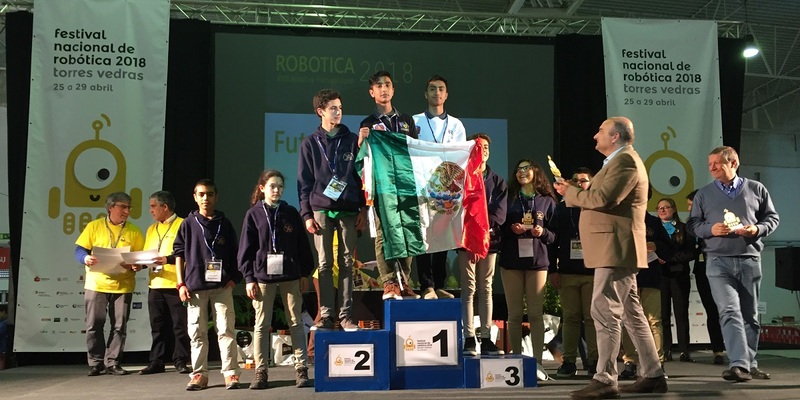 Congratulations to the chaBots team! 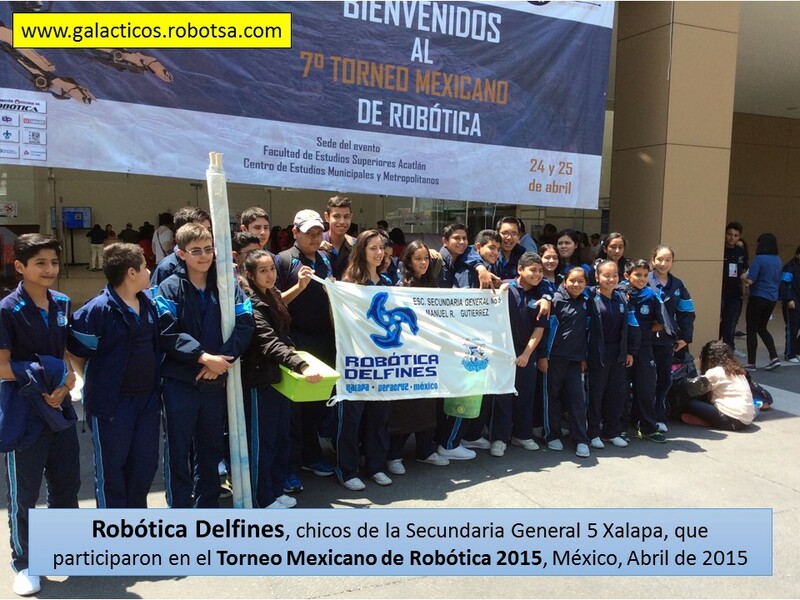 We hope you do well at RoboCup 2015 in China. In the following photo, the Galacticos guys go through their SECOND PLACE trophy. 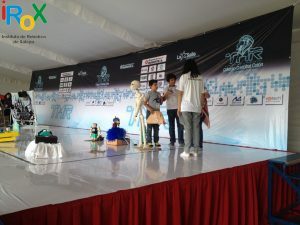 In this photo, the Galactic boys posing with their SECOND PLACE trophy (the middle boy has it) and gifts from the sponsors of the event. 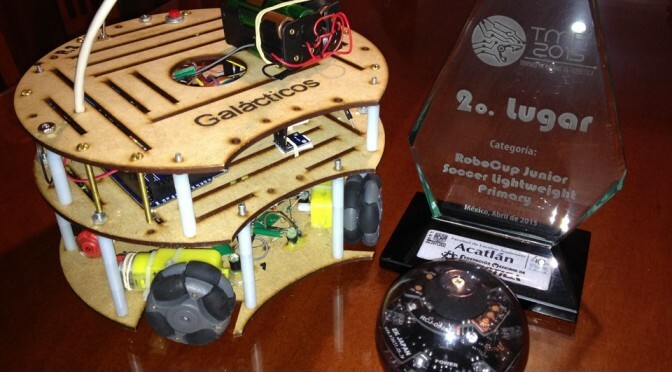 Our two Galacticos robots with the SECOND PLACE trophy. 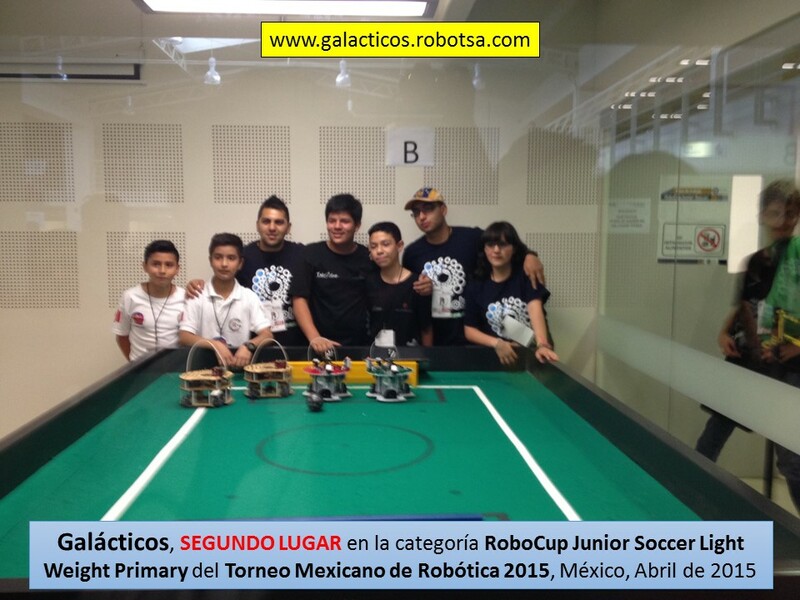 One of our new Galacticos robots with the SECOND PLACE trophy of the TMR 2015. I thank the participating children, mothers and fathers who unconditionally support the boys. Finally, a strong thanks to our sponsors, who thanks to them we were able to acquire new robotics material and make the trip from Xalapa to the State of Mexico to participate in the 2015 Mexican Robotics Tournament. Write us an email to: galacticos@robotsa.com. 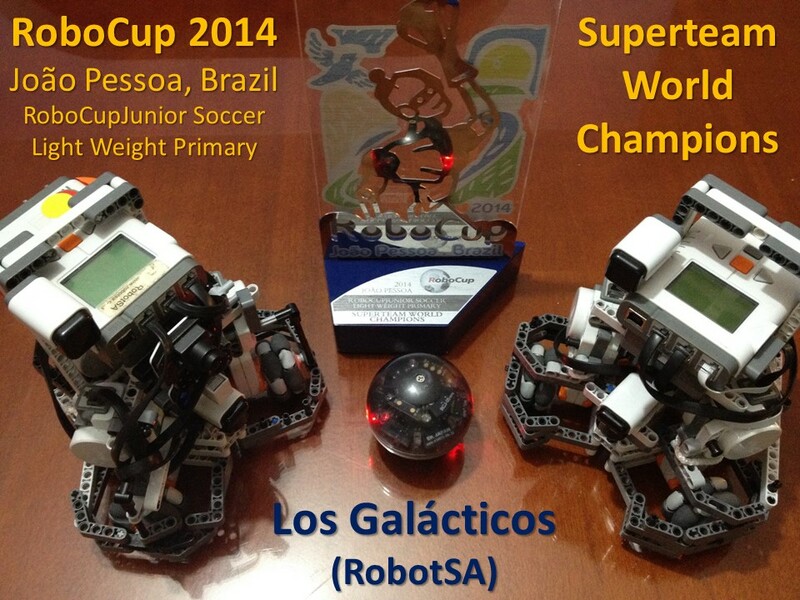 Our team Los Galacticos was Supertem World Champions in RoboCup 2014, Brazil. 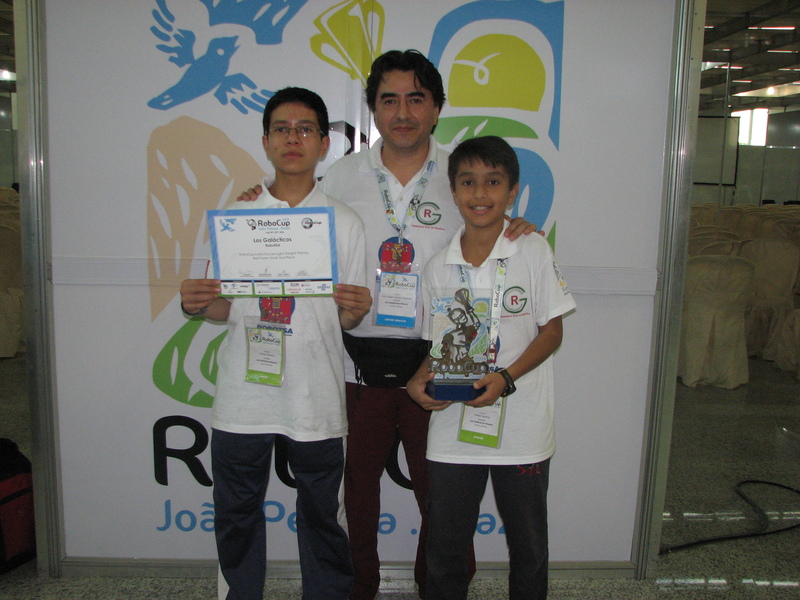 To all our relatives, friends and organizations that have been awaiting the participation of the Los Galacticos robotics team, here are the results obtained by our participation in the RoboCup 2014 international robotic competition, in the city of Joao Pessoa, Paraiba, Brazil, from July 19 to 25, 2014 (www.robocup2014.org). Los Galacticos with recognition of second place for best teamwork and trophy of first place in Superteam. We were at RoboCup 2014 in Brazil, participating in one of the most important robotics competitions internationally, proudly representing Xalapa, Veracruz, Mexico. 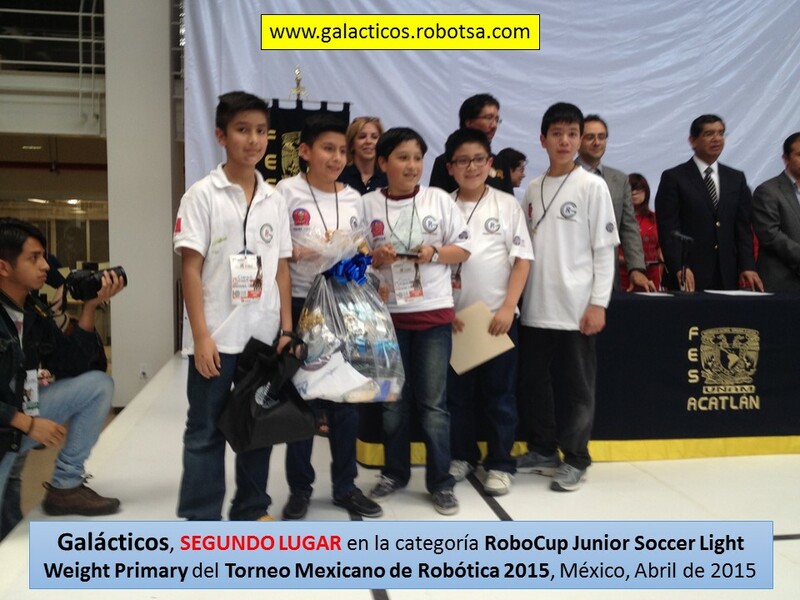 We won 8 of 13 participating teams in the RoboCupJunior Soccer LightWeight Primary category. 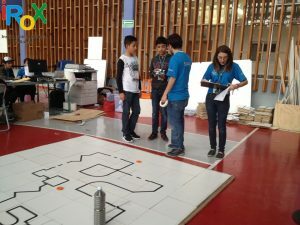 In this category, children up to 14 years old build and program two robots that play soccer. We won Second Place (Certificate) for better teamwork. We won First Place (Trophy) for our participation in the Superteam competition. In this competition we made a “super team” with four other teams and competed against two other Superteam of our same category. In a Super Team match. 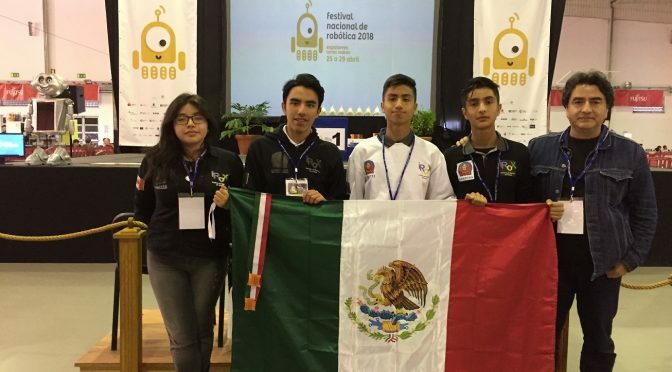 This year is the first time that we integrated a team of children for a national competition, the Mexican Robotics Tournament 2014, in which we won the first place and the right to participate in RoboCup 2014 in Brazil. In the international competition we obtained very good results, what motivates us, parents, children and mentor to continue working forming children that possibly in the future, could be national and international leaders in the area of robotics. 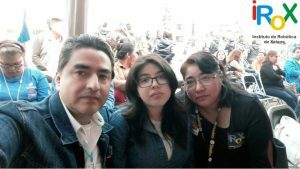 Ministry of Education of Veracruz, SEV (Oficialía Mayor, Lic. Vicente Benítez González). H. Municipality of Xalapa (Américo Zúñiga Martínez). Foundation for International Higher Education, A.C. (FESI). H. Congress of the State of Veracruz (David Velasco Chedraui and Ricardo Ahued Bardahuil). Rafael e Imanol in a match against the EU team..
Also, we thank our relatives and friends who made a voluntary contribution that was very helpful. 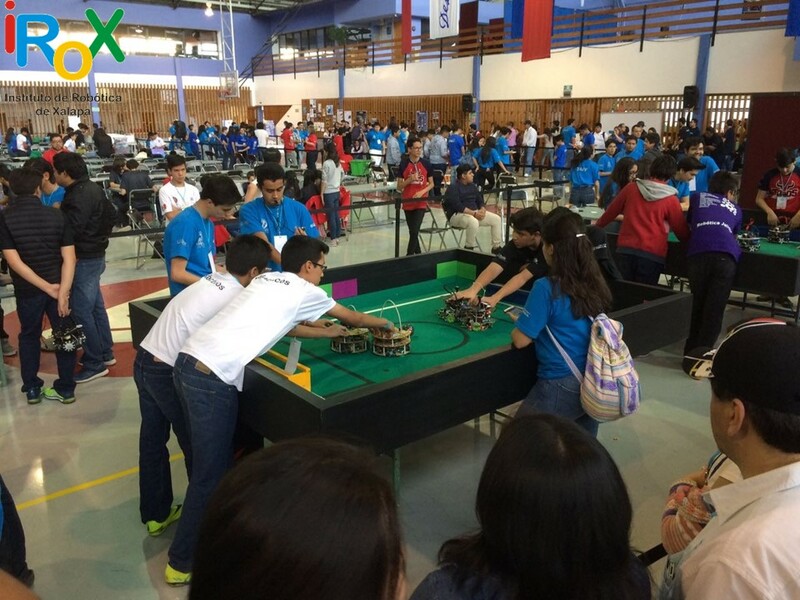 In total, so that children could participate in RoboCup 2014 in Brazil, we managed to collect an amount equivalent to the total expenses of one person. Amount with which we cover air tickets, registration to the event and food for two of the children. Their lodging, ground transportation and other expenses were covered by the respective parents. Unfortunately, one of the children could not go to Brazil, due to the lack of economic resources, to cover the difference that was needed. 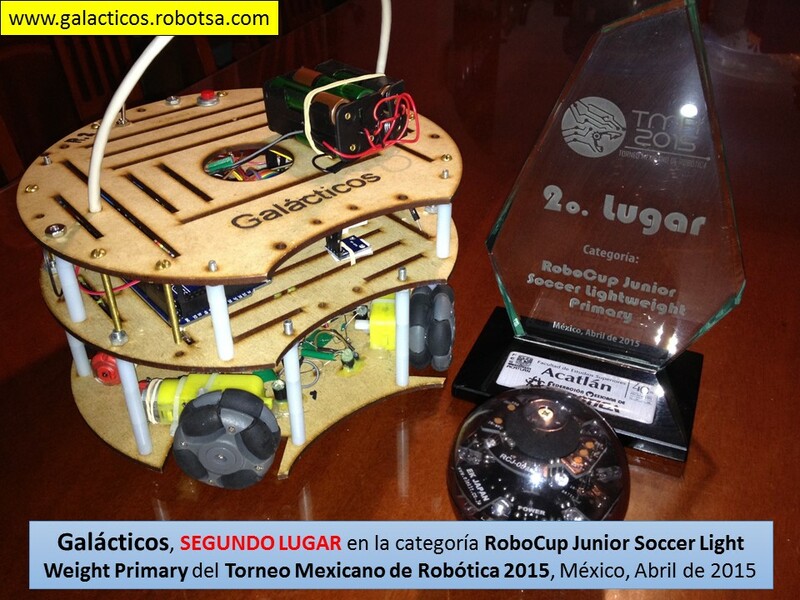 In April 2014 I participated with Los Galacticos team that won the FIRST PLACE in the RoboCupJunior Soccer Lightweight Primary category of the Mexican Robotics Tournament (Torneo Mexicano de Robotica 2014). 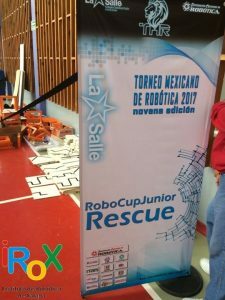 The team represented RobotSA (a technology microenterprise) and consisted of two 12 years old children, a 13 years old boy and Julio Sandria (Julio Cesar Sandria Reynoso) as the Mentor. The robots played soccer in a small field, and they were armed and programmed by the children. 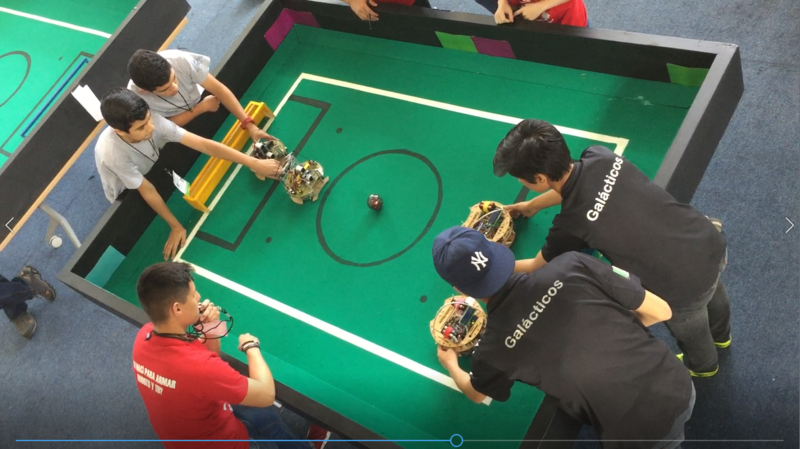 In this YouTube image and at the end of this article there is the link to the video edited by two of the children, with a summary of the last three games that our team won. 4to. Torneo Mexicano de Robots Limpiadores (2007), winning two first places. 3er. 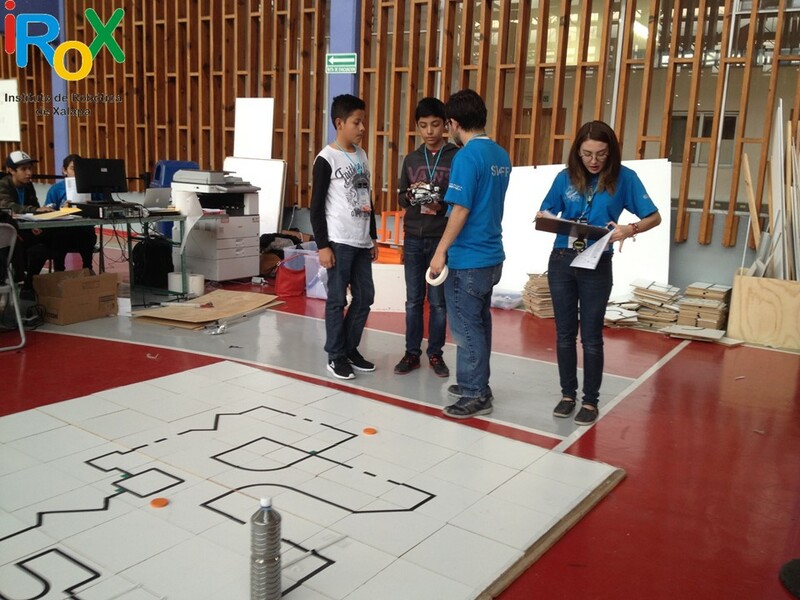 Torneo Mexicano de Robots Limpiadores (2006), winning two appointments to the most ingenious prototype. 2do. Torneo Mexicano de Robots Limpiadores (2005), winning second place. 1er. 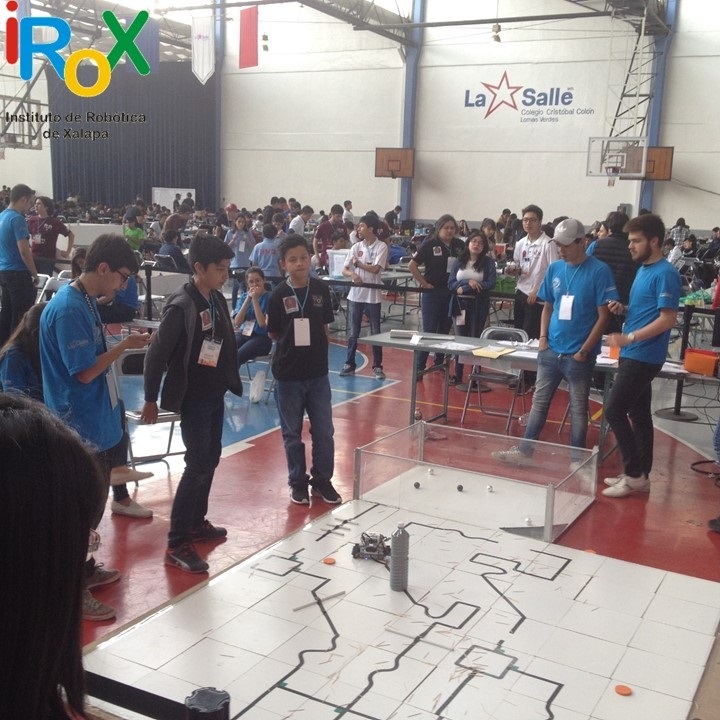 Torneo Mexicano de Robots Limpiadores (2004), winning second and third place. 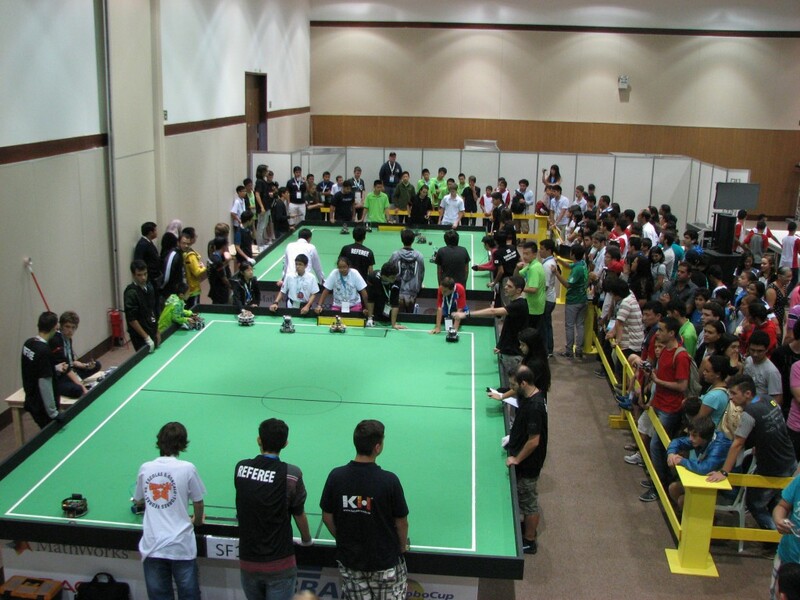 The idea of participating again in robotic tournaments was latent for several years. In 2003 I started with Lego Mindstorms RIS 2.0 robotics packages and since 2007 I have acquired some Lego Mindstorms NXT packages, Lego Mindstorms NXT 2.0 and Lego Mindstorms EV3. 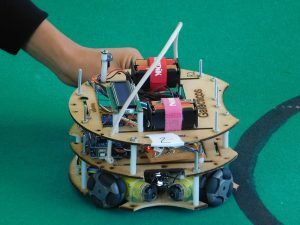 In December 2011 I bought two infrared balls, omnidirectional wheels, compass sensors and infrared sensors to start making tests with soccer robots. 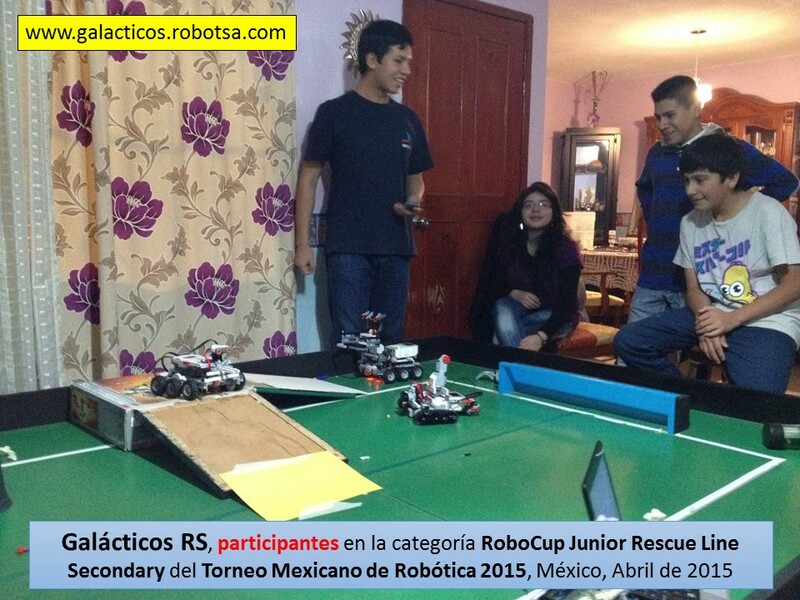 In February 2014, using the material prepared for my course Programación de robots futbolistas con Lego Mindstorms NXT, I started the formal preparation of Los Galacticos team and soon after the Sandria team, to participate in the Mexican Robotics Tournament 2014 that took place in Ciudad del Carmen, Campeche (Mexico), from April 10 to 12, 2014. 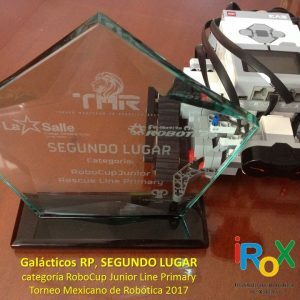 The team Los Galacticos participated in the category RoboCupJunior Soccer Lightweight Primary, for children up to 14 years old. 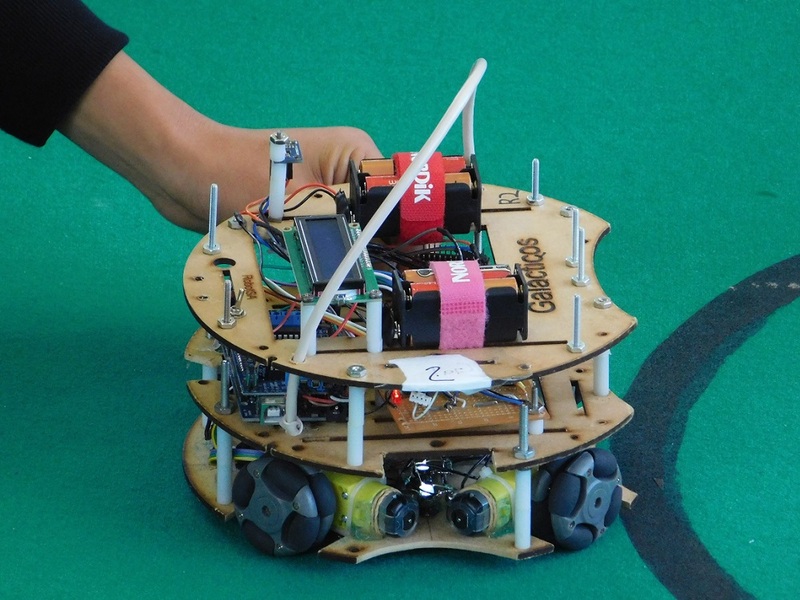 In this category, robots play soccer in teams of two against two. 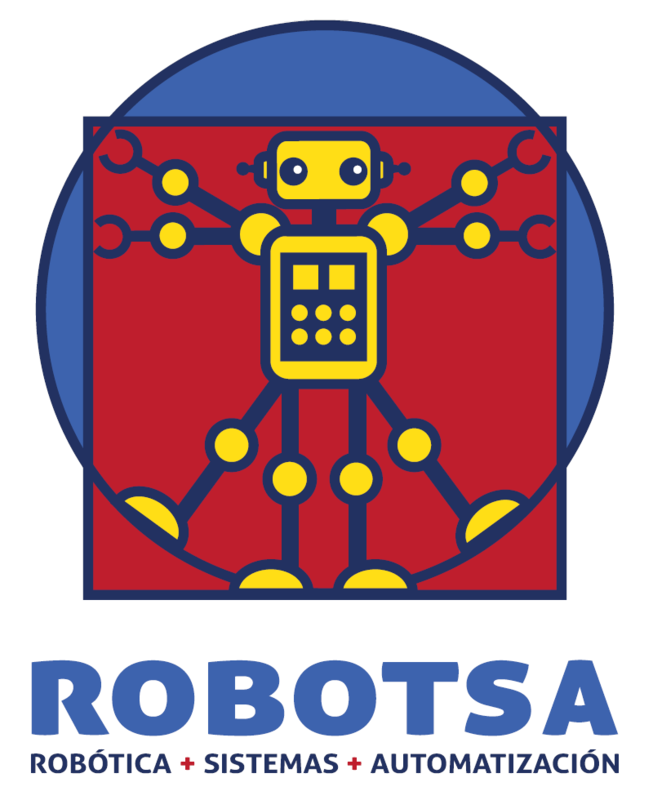 RoboCup is a global initiative to promote work and research in robotics and artificial intelligence. 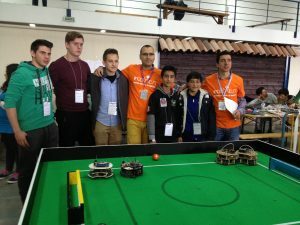 Its website is www.robocup.org. RoboCupJunior is an educational initiative that promotes local, national and international events for children and young people up to 19 years old. 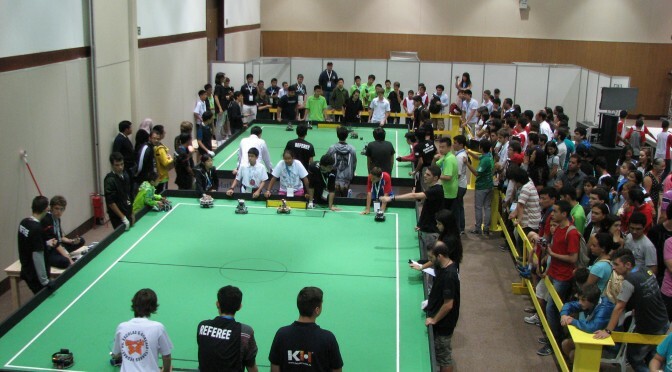 Its website is rcj.robocup.org. 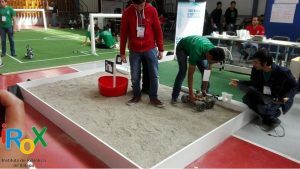 To form a competitive team, in addition to working on the design and programming of the robots, we built a field with the regulatory measures to test them. The boys returned from school and spent a few hours “playing” with the soccer robots. 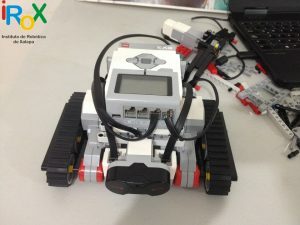 We used Lego Mindstorms NXT robots, I taught them and explained the model that I thought was the right one to put together and they put it together. I also explained the programming of the Lego Mindstorms NXT Software for these particular robots, which they understood quite well. In fact, it was very useful for two of them to have participated in the summer courses I taught in 2012 and 2013. The children even had up to four soccer robots to do all the necessary tests before the competition. 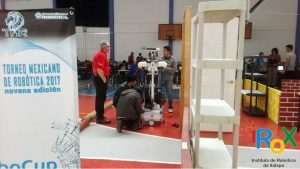 The second team, Sandria, participated with a rescue robot, in the category RoboCupJunior Rescue A Secondary, for young people up to 19 years old. They made a prototype with a Lego Mindstorms NXT 2.0 and another with a Lego Mindstorms EV3. We decided on the first, because they still did not dominate the second. In the rescue test we needed to work more, and the team won the sixth place of 21 participating teams. 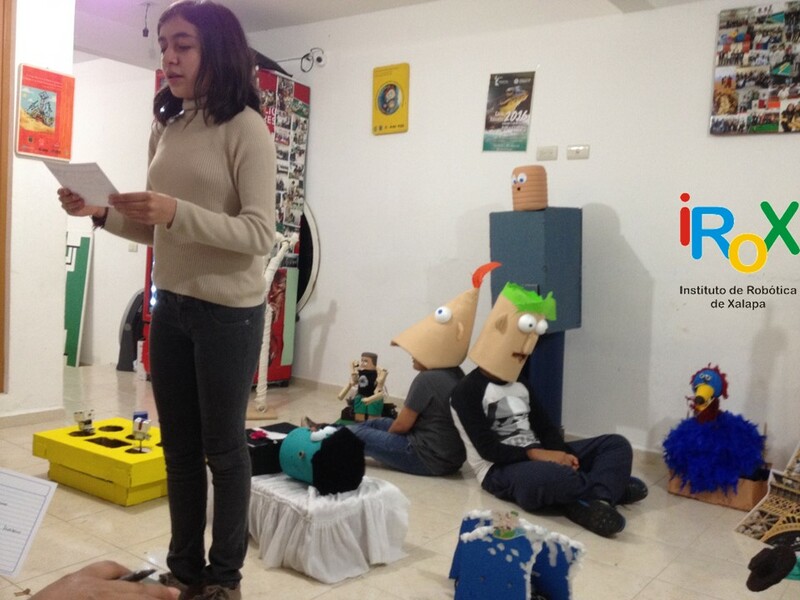 Still, I’m sure that with the last effort that the kids did, they learned even more about programming. During the event, at the Universidad Autónoma del Carmen, when we arrived at the competition area we were always greeted by the mascot (on poster) that can be seen in the following photo. I also took a picture of my badge as a Mentor of the Los Galacticos team. 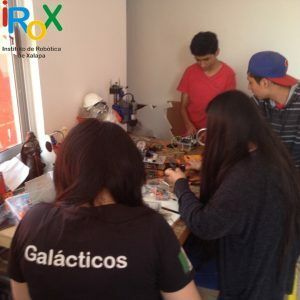 In the following images, the first photo shows the guys sitting at their desk, making the last adjustments before their participation. In the second picture you can see the playing fields for RoboCupJunior Soccer games and more participants from other categories. In the following photos: Me, during a break, and the boys, at the entrance of the Sports Unit of Campus II of the Autonomous University of Carmen. In the following photo the team Los Galacticos before the first game. We tied the first one, we lost the second and we won the third one, with what we could go to the next round. We won in the quarterfinals and semifinals. The following photo was taken before starting the final match. The children seemed nervous. WE WON THE FINAL MATCH! Photo of the memory, with the team that was in second place. Before the delivery of trophies. And Los Galacticos receiving the trophy of first place. 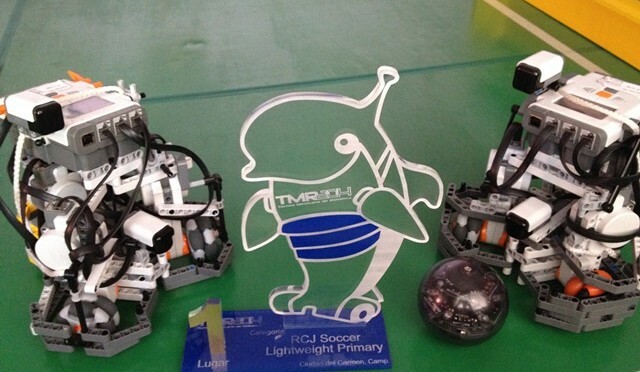 In the following photo, the champions of RoboCupJunior Soccer Lightweight Primary with their trophy. CONGRATULATIONS GUYS! 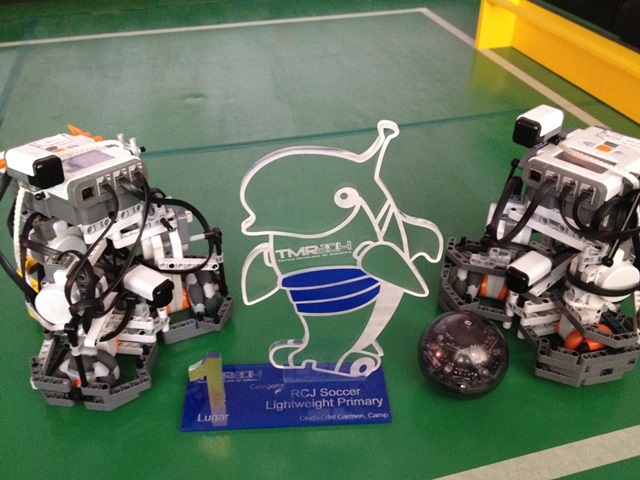 Back at home, the two robots from Los Galacticos with the 1st place trophy. 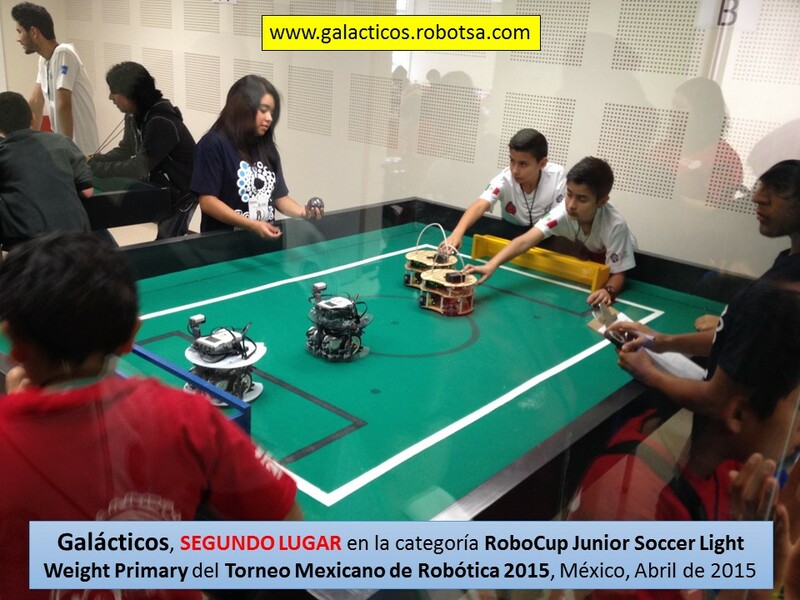 The following video shows a summary of the quarterfinal, semifinal and FINAL matches of Los Galacticos team, champion of the RoboCupJunior Soccer Lightweight Primary category in the 2014 Mexican Robotics Tournament. The video was edited by two of the boys from the equipment. The screams of goal and win are from the Mentor. 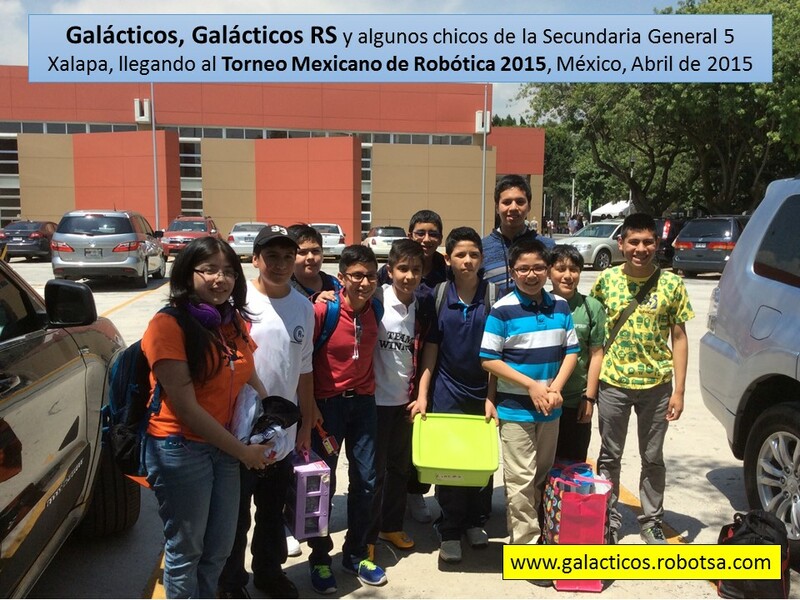 This is the website of Galacticos, a Robotics Club in Xalapa city, state of Veracruz, MEXICO. 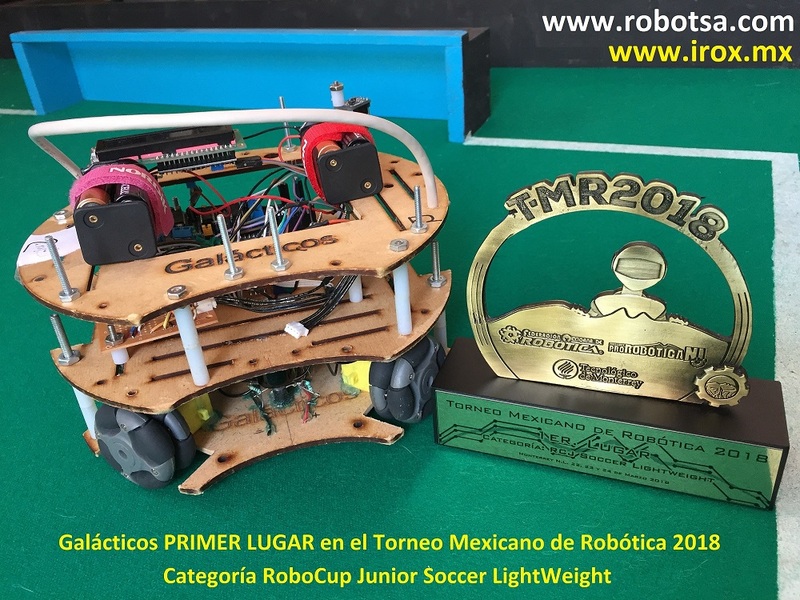 We are a team of roboticists that won FIRST PLACE in the category RoboCupJunior Soccer L. Primary in the Mexican Robotics Tournament 2014 (TMR 2014). 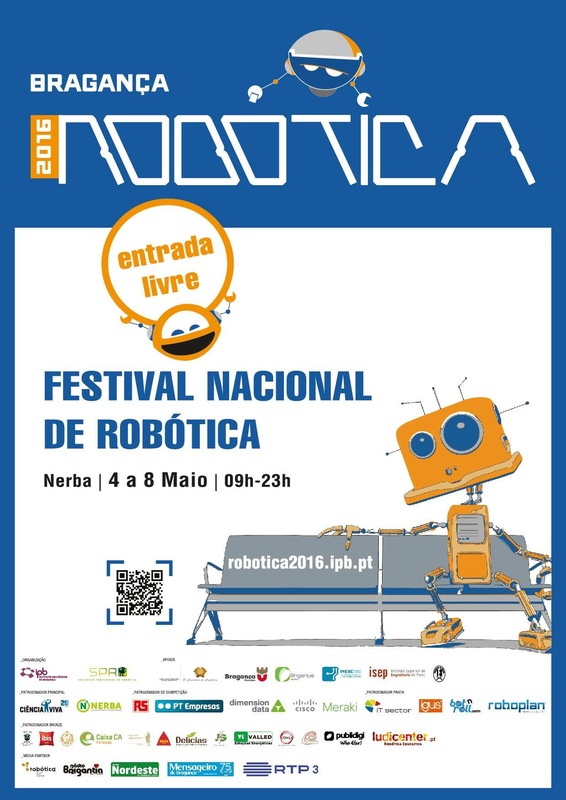 Thanks to this, we have the opportunity to participate in the international competition RoboCup 2014, which will take place in Brazil, in July of this year. 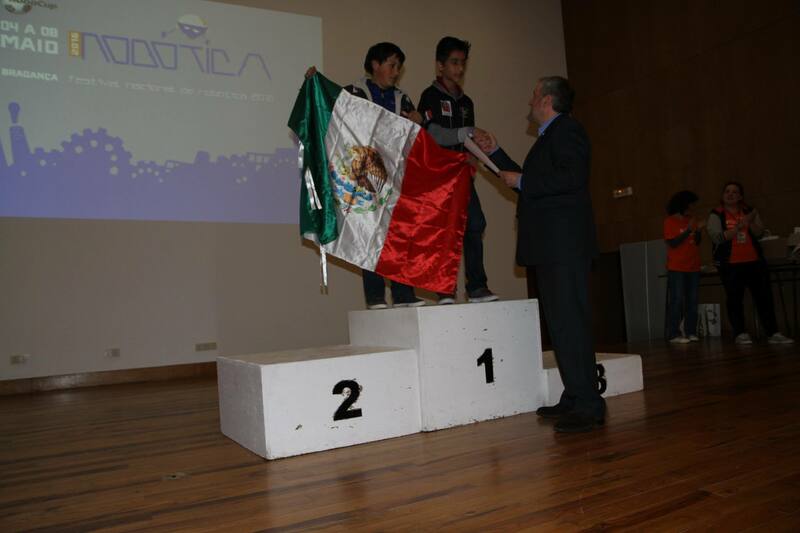 The winning team consists of three children from 12 to 13 years old and the Mentor, Julio Sandria. 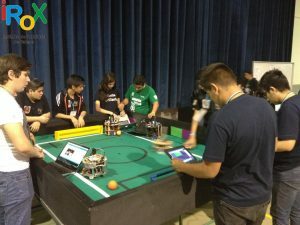 We have more than 10 years of experience participating in robotics events, as well as offering robotics courses for adults and children. To participate in Brazil we have several sponsorship opportunities quite convenient for both parties. On this website we will publish our experiences nationally and internationally.